Dec. 1, 2013 3:00 p.m.
On October 23, 2013, 23 Griffiths-Scott Middle School students and 2 teachers boarded a bus in the early morning hours to join 16,000 other students from around the province to attend Alberta’s second We Day at the Calgary Saddledome. We Day is an educational event organized by the Free The Children charity started by brothers and child rights advocates Mark and Craig Kielburger to inspire students to make and be positive changes in the world and their communities. This is the second year that Griffiths-Scott Middle School has participated. This year speakers and performers included Martin Luther King the 3rd, Mark and Craig Kielburger, Down with Webster, Magic Johnson, Amanda Lindhout, Nelly Furtado and Spencer West to mention a few. The performances and speeches were geared to inspire and empower youth to be the change that they would like to see in the world. The Griffiths-Scott students competed for the chance to attend by writing essays on How to Inspire Change. Attendance is free and in return schools that participate in We Day are asked to undertake one local and global action for change during the course of the year. Last year the students raised enough funds through their penny drive to provide water for 52 people for life in impoverished countries. So far this year, a student on the We Day team has been selling Rafiki Water Bracelets for $10, each bracelet sale provides water for one person for a year. Although this is only the second year of We Day in Alberta, this is the sixth year of the movement. In the 2009-2010 school year, students participating in the We Day initiative raised 3 million for global action projects, 1.5 million for local action projects and have logged over 1 million hours of community service. 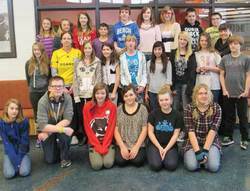 Griffiths-Scott will also be included in the RBC H20 4U speaking tour as part of their We Day participation. This speaking tour raises awareness and encourages youth to fundraise for clean water at home and around the world.